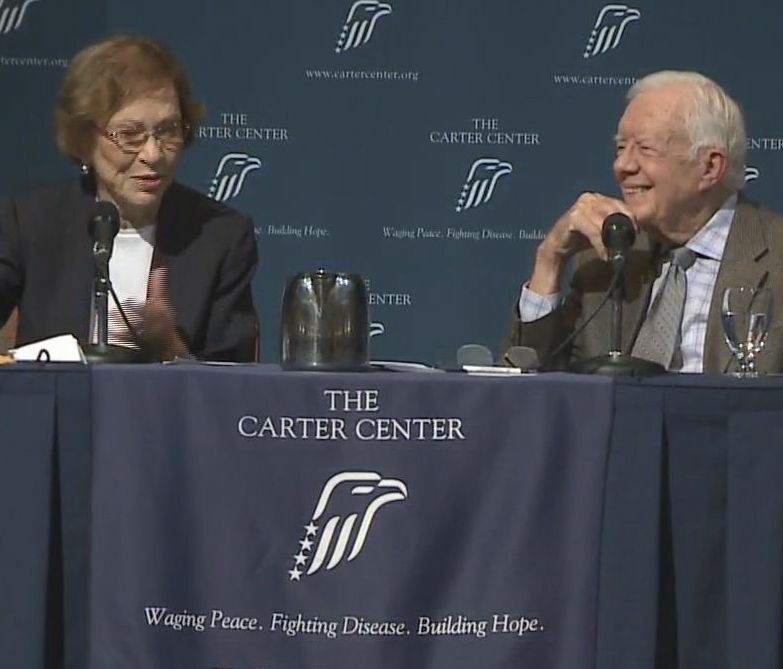 ATLANTA (WXIA) -- This is an annual event with the Carters, open to the public, and during most of the hour-long event President Jimmy Carter and his wife Rosalynn answer questions that people submit. 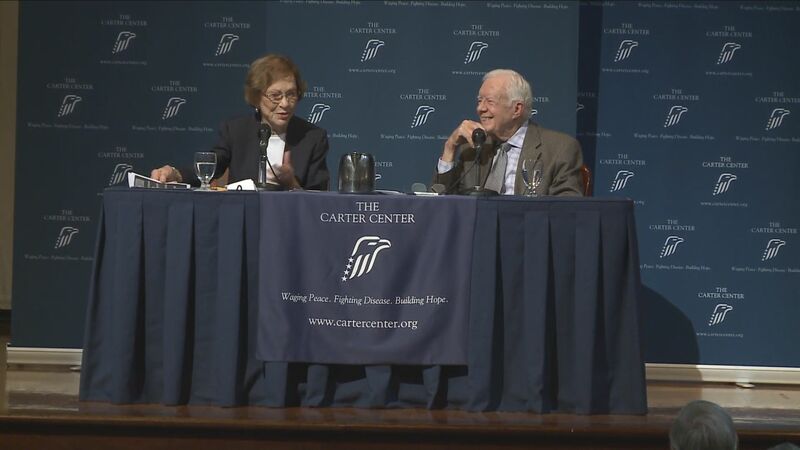 President Carter smiled and said his cancer treatments are going well. Mrs. Carter shed tears of gratitude. The Carters were as robust and excited as ever as they talked about the work of the Carter Center around the world, and talked about his cancer treatments. Mr. Carter laughed again as he disclosed another part of his treatment -- drinking lots of water every day. "One of the worst things I have to do.... I started out with 84 ounces of fluids a day. And now the doctors have been nice enough to cut me back to 64 ounces a day. So instead of getting productive work done, I spend a lot of time in the restroom, as you can probably imagine." The crowd was laughing with him. And at that, the Carters quickly began talking about world problems and solutions. One question from the audience – what to do about ISIS. “I would like to see the United States be more forceful in dealing with ISIS,” Carter said. “I would not – at least publicly – favor sending ground troops in. But I think we could have better surveillance on our bombing, and better analysis of what is going on there. And I think we could cooperate with others, like, perhaps, even the Russians and the Iranians, in dealing with the opposition in Syria that comprises the ISIS factions. And if all of the forces in Syria could turn against ISIS, that would be a wonderful opportunity. But I don't think there's much doubt that Assad would not be able to work that out. But maybe with the United States and Russia and Iran's cooperation, they could concentrate on ISIS more. It's not an easy thing to answer.... The main forces fighting against ISIS, now, in Iraq and Syria, are the Iranians. And although we have the same goal of attacking ISIS, we don't find ourselves able, at this time, to cooperate with the Iranians on anything, except maybe the nuclear deal"
At one point during the hour, Mrs. Carter took a moment -- after speaking in detail about the work of improving mental health treatments around the world -- to tell the world, "Thank you." On Wednesday, President Carter is scheduled to address incoming freshmen at Emory University. On October 1, he will celebrate his 91st birthday.